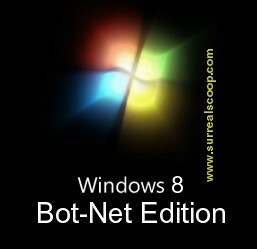 The news of the existence of an indestructible computer system has prompted software giant Microsoft to look to include the TDL bot-net into future versions of Windows as both a time-saving feature for users, but also as a key software distribution platform. The bot-net apparently contains advanced levels of encryption preventing investigators snooping on the traffic between computers upon which it is installed. This contrasts with Microsoft’s Internet Explorer that is surely only one patch away from automatically detailing your credit card details in a full page advert in The Times. However industry analysts have observed that it is unlikely that Microsoft’s quest to formally integrate TDL into the next update to Windows will go unchallenged by the other big online players. Investigators around the world are keen to track down the developers of TDL in the hope of gaining not only a better understanding of the gangs behind the software and what they might be using it for, but also to ask if they could help configure the office printer.